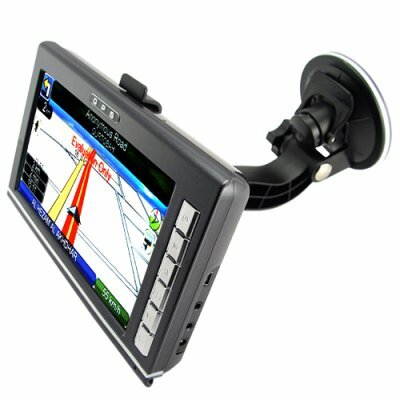 Successfully Added 7 Inch Portable GPS Navigation Touchscreen Unit to your Shopping Cart. 7 inch GPS navigation and multi media unit with touchscreen interface. Do you want a large screen GPS navigation system for when you are on the road but do not want to go to the trouble or expense of installing a 2-DIN unit into your car? Do you need a GPS navigator that you can use in your car as well as when you are walking around the city? Then have we got the answer for you! This portable 7" TFT (16:9) touch screen GPS unit will guide you anywhere you need to go in the city or country, plus comes with the Win CE operating environment, meaning it works with almost all of todays popular GPS software packages. Very easy to install and operate, the CVSB-CS07 features a flexible arm bracket for easy installation in your car and is compact enough to be used as an all-in-one portable unit (while at the same time having a very large 7 inch crystal clear display!). So not only can this new GPS navigation unit can be used as a modern car GPS or portable system, but it can also be used as your cars Bluetooth handsfree device. With its additional rich media features, when you are on the train or camped down for the night, this unit can also be used as a convenient media player (digital audio and video files). So thoughtfully designed, this unit even has an earphone jack and mini-USB to enhance its everyday usefulness - from GPS unit to guide the way to portable media player for maximizing enjoyment during your down time away from the road. A great wholesale price makes this unit perfect for the resale market, VAR and OEM market, or simple personal/company use. As always, it is only available from your source for wholesale direct from China electronic products, Chinavasion. 7 inch GPS and multimedia unit with touchscreen interface. Use it as your vehicle GPS unit or take it out of the car and put into your bag or backpack so you can use it in your daily life in the city or country. Use it while on holiday - slip in an SD card for the new area of the world you will be exploring and you never have to worry about getting lost! The unit includes an SD card with evaluation GPS software. You will need to purchase GPS map software for this product to function properly as a navigator. After an extensive review of the available global GPS map providers we have found that the best GPS maps for each region of the world, including Europe, South America, Arabia/Middle East and North America, are usually found in the users own country. Therefore we encourage you to buy GPS map software from a supplier in your home country. The car GPS should work with IGO 8, however Chinavasion does not hold responsibility for GPS software/maps installation. This is at the user's own discretion. What is the maximum capacity SD card compatible with this unit? The device can support a 2GB SD card. on 2009-07-15 15:20:31 Beachtliches Gerät für den Preis! Schnelle Lieferung aus China, tolles Gerät. Nur einen Makel: der interne Lautsprecher lässt sich nur durch einstecken eines 3,5 Klinkenstecker (Kopfhörer) ausschalten. 95% von 100%!